Do I feel like iron woman after an iron IV? No, not really. The downside of avoiding annual physical exams for oh, let's say a decade or so, is eventually facing the "what if" scenarios. What if that lump is cancerous? OMG, is that a leprosy rash? What if that cough is really the beginning of that fatal cough in Stephen King's The Stand? Yes, I know. A little far-fetched but it could happen, right? Well, maybe. I confess, if my employer had not establish an incentive program my medical woes would have been minimal over the past couple of years yet at the same time, I'm extremely grateful. Over the past 18-months I've dealt with a breast cancer scare (the MRI-guided biopsy was negative), appendectomy (I realize nothing could have prevented that and REALLY grateful I no longer need to worry if that pain in my right side is my appendix ready to burst), fibroids, cysts, high cholesterol and lastly, I was diagnosed with Type 2 diabetes almost a year ago. Oops! I guess this is the messy part about life you're not supposed to blog about but oh well, life is too short to be concerned about such matters. All the while, I've had blood work done for almost two years which showed an increase in blood platelet levels. I was instructed to take a child's aspirin everyday yet the platelet count didn't decrease. The good news is I don't have leukemia or lymphoma yet as it was explained to me, there's a protein in my blood which is an indicator for one of those diseases. My bone marrow is producing this protein but everything else in my blood is OK indicating everything is fine as frog hair, kind of. I need to have my blood tested every three months to make it doesn't develop other indicators. I'm not sure for how long I need these tests, whether for the rest of my life, for five years or until something bad develops. My iron level was low, as in 8-something when it should be in the 20s. My options to get the iron up were either a bazillion weeks of iron shots or (hopefully no more than) two intravenous injections of iron. I opted for the latter, I don't have time to come in for a boatload of shots! As long as insurance paid for it, I was in for the Feraheme injection, in human-speak, an Iron IV. I Am Iron Woman, Hear Me...Yawn? Feraheme treats iron deficiency anemia (and now that I'm researching, it's given to people with chronic kidney disease - is there something else I'm not being told???). I had no idea I was anemic. Aren't you supposed to be tired when you have anemia? Or have little white dots on your fingernails? I thought the only reason I'm tired during the week is because I get about six hours of sleep! All I could think of was how a nice plate of fried liver and onions would be for lunch or maybe some clams (they're an awesome source of lean protein). Anyway, I was escorted to the cancer center's treatment room where I saw men and women at least two decades older than me hooked up to IV bags and curled up on recliners. Some were covered in blankets, some read while other napped. Most were receiving chemotherapy and I felt guilty being there. I was "just" there for a shot of iron and 45 minutes later would be on my way to lunch while most everyone else would be there for one to two hours or longer. They were fighting for their lives. At the time I didn't, and almost a week later I don't, feel different, which I guess is normal. The deficiency making me tired is lack of sleep! I've been able to keep up with Shaun T's Insanity (kind of; I haven't thrown up although I came close last night), my lawn, my blogging (well, sort of) and the day job so I don't understand how I will know if it's doing its thing. If the last 18 months dealing with medical professionals has taught me anything it's to take control of my health and educate myself about the issues and options. Have you had an iron IV? Did you feel better? 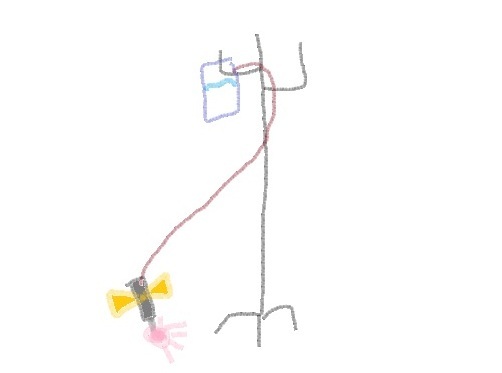 Hope you enjoy the above drawing - photography, especially from cell phones, is not permitted at the cancer center - so I drew the above IV tree from memory. The IV was placed in my hand vs. my arm, which is what that pink blob represents.